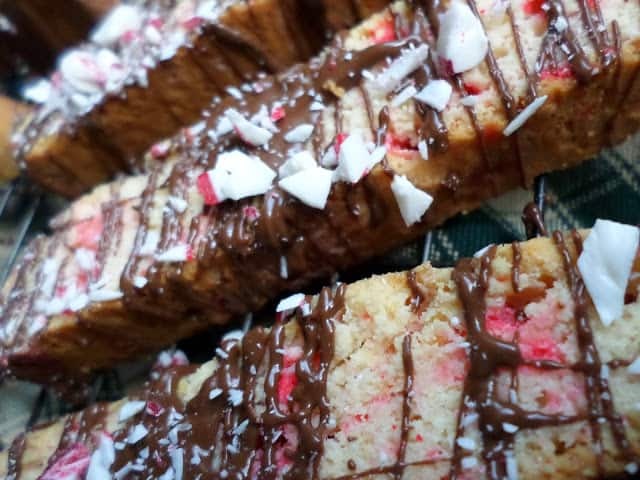 Peppermint Biscotti are the perfect holiday “cookie.” Made with crushed peppermint disc candies or crushed candy canes, peppermint biscotti are cool, minty and refreshing. A light drizzle of melted chocolate adds the right amount sweet goodness. They’ll definitely stand out on your holiday cookie platter this season. Biscotto; pl. Biscotti [bee-SKAWT-toh; bee-SKAWT-tee] is a twice-baked Italian biscuit (cookie) that’s made by first baking it in a loaf shape, then slicing the baked loaf and baking the slices. The end result is an intensely crunchy cookie that is perfect for dipping into dessert wine or coffee. Biscotti can be in many different ways. The most popular additions are anise seed, hazelnut or almonds. In a large bowl, cream butter and sugar. Add eggs, one at a time, beating well after each addition. Beat in extract. Combine the flour, baking powder and salt; stir in peppermint candy. Gradually add to creamed mixture, beating until blended. Mixture will be stiff. Divide dough in half. On an ungreased baking sheet, roll each portion into a 12-inch x 2-1/2 inch rectangle. Bake at 350º for 25 to 30 minutes or until golden brown. Carefully remove to a wire racks; cool for 15 minutes. Transfer to a cutting board; cut diagonally with a sharp knife into 1/2 inch slices. Bake for 12 to 15 minutes or until firm. Remove to wire racks to cool. In a microwave-safe bowl, melt chocolate chips and shortening; stir until smooth. 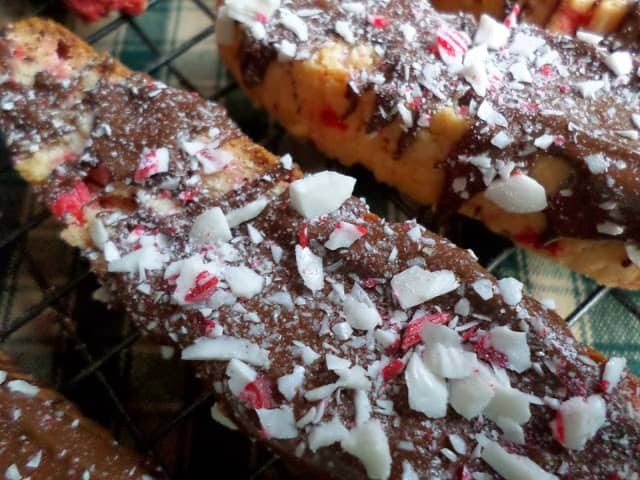 Drizzle chocolate over biscotti and sprinkle with crushed candy. Place on wax paper until set. Store in airtight container. More holiday cookie recipes; Belgian Tuile Cookies and Moravian Spice Crisp Cookies. So pretty! I am craving peppermint EVERYTHING this time of year!! The cookie swap sounds like fun! 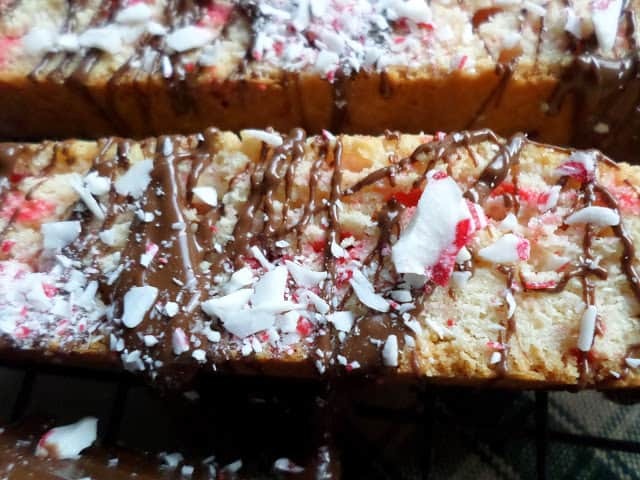 Your biscotti look perfect for it…very festive. What a treat it would be to open a tin of these. Thank you for sharing, Lynn. Looks like you ladies have so much fun with your cookie swap. 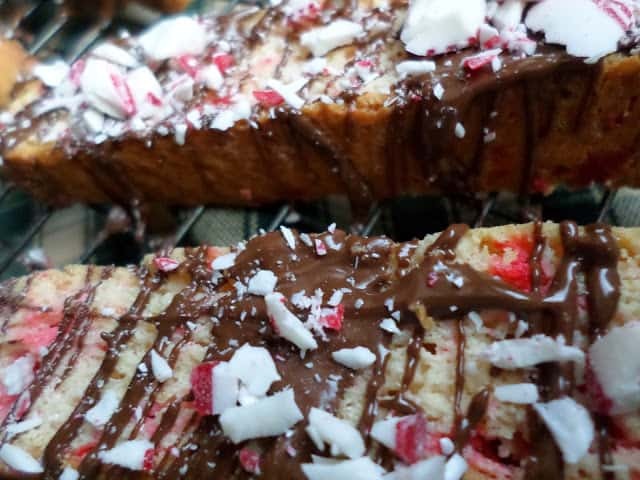 Your Peppermint Biscotti looks awesome! Thanks so much for sharing with Full Plate Thursday and enjoy your weekend! Hi Lynn, I love biscotti, but always buy them. I haven't yet tried to make them. My sister always makes them and she keeps telling me to try it, they are easy. I'll have to try your recipe, it sounds delicious. Thanks for sharing it with Foodie Friends Friday Christmas Cookie Exchange Party this week. Yum! Perfect for the holiday season 🙂 Great pick for the swap! Oh, yum! These look delicious. 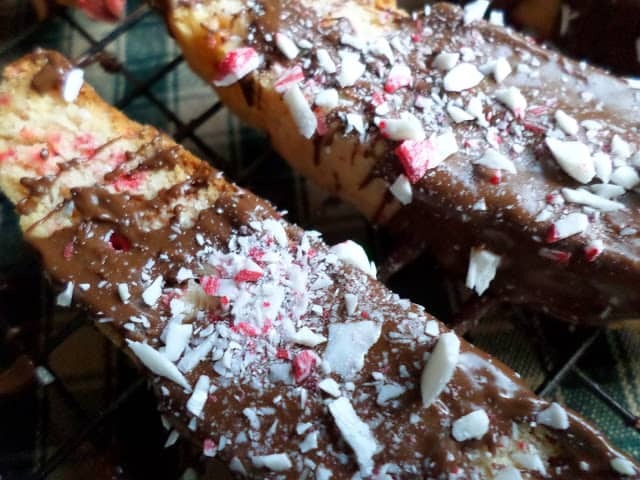 I'm definitely bookmarking these into my Christmas Cookies folder! Hi Lynn, I hope you got my cookies…. these look good! Hi Deb~ Yes, I received your delicious cookies:) They were absolutely wonderful~ Thanks You!! !